The truth finally comes out: Human Rights Watch says Gaza “armed groups” commit war crimes by targeting Israeli civilians. The Human Rights Watch (HRW) issued a rare condemnation of Gaza terrorists on Monday for war crimes - without the usual “balancing act” of blaming Israel. HRW did not go so far as to describe “Palestinian armed groups” as terrorists, but the categorical censure of rocket launchers marks a drastic change in the attitude towards Israel and Hamas. The condemnation also comes at a critical time for Hamas, which claims it “won” the missile war by gaining implicit diplomatic recognition to a certain extent. Between November 14 and 21, Gaza terrorists fired approximately 1,500 missiles at Israel, and more than half of them exploded in Israel, including 60 in populated areas. More than 40 people were either killed or wounded, not including two Gaza Arabs who were killed by their own misfired rockets, Human Rights Watch said. Human Rights Watch interviewed witnesses, victims, and relatives of people killed and injured by rocket attacks in Israel, as well as Israeli officials from two communities struck by rockets, and a spokesperson for the Israeli emergency medical services. HRW names the “armed groups" as Hamas, Islamic Jihad, and the Popular Resistance Committees’ terrorist branches. HRW also blamed Iran, based on an Iranian military official's statement Iran provided technical information to Gaza terrorists for building their own medium-range Fajr 5 missiles that were fired on Tel Aviv and Jerusalem. Iran denied having supplied the missiles to Gaza. “Supplying weaponry to a party to a conflict knowing that it is likely to be used to commit war crimes constitutes the aiding and abetting of war crimes,“ Human Rights Watch said. Magen David Adom told the rights group that their medics treated 38 civilians wounded by missiles, three of them severely. 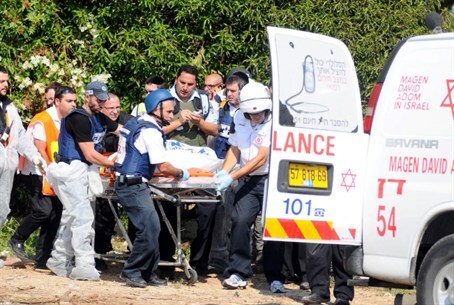 A 50-year-old man in Ashkelon lost a foot that was “traumatically amputated by a rocket blast,” and a man in Ofakim was severely wounded when a rocket hit the car in which he was riding. Human Rights Watch also blamed Gaza terrorists for firing rockets and missiles from densely populated areas. After interviewing witnesses in Gaza, it confirmed Israeli military reports that terrorists fired rockets 300 feet from international media offices. “I saw it [the rocket] go up and heard it, and then smoke was in the office,” a witness said. “One man said he saw a rocket launched from the yard of a house near the Deira Hotel in central Gaza City,” HRW added.